Cheese sits at the top of my list all the time!! Who doesnt like Cheese?? Its Cheese!! However, it’s so sinful. On diet and craving for some cheesecake? I’ve got it sorted for you. 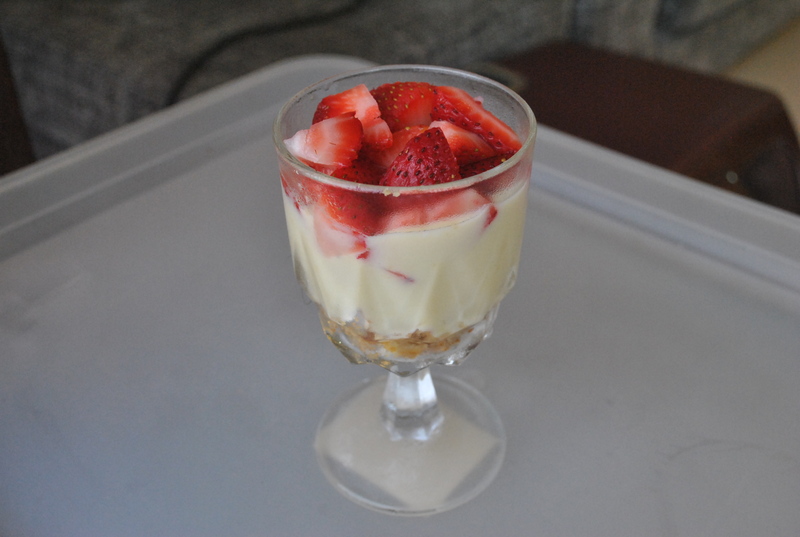 This Low Fat “Cheesecake” Trifle is perfect for you. One cup/serving like this is lower than 200 calories and it tasted almost like a cheesecake. I’ve gotten this idea from Laura Vitale. But i did make some slight changes to the original recipe. – Crush the biscuits. Melt 1 tsp of butter and mix them together . Divide the crushed cookies between 2 trifle cups. – Mix lemon curd and yoghurt together until smooth and place on the crushed biscuits and top with some diced strawberries. – Refrigerate for about 1/2-1 hr before serving. Note*: You can get ready made lemon curd from the supermarket but i couldnt find it in NTUC/ Cold Storage. You probably could try Higher end supermarkets. Hence, i made my own lemon curd. I got my lemon curd’s recipe here. Even though the non fat yoghurt is not sweet, there is no need to add sugar to the yoghurt because the sweetness will come from the lemon curd. Best serve about 1 hr after making. Not recommended to leave the next day. My biscuits turned a little soggy the next day. You have to scoop and eat the strawberries, yoghurt and biscuits at the same time so that it’ll taste like “Cheesecake”.